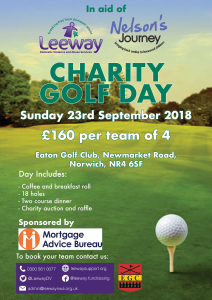 We are very excited to announce a golf day to support Nelson’s Journey and Leeway being held at Eaton Golf Club on Sunday 23rd September. We would love to encourage anyone who wants to come along and bring a team – female and junior teams are very welcome too! Teams of 4 cost £160 and include breakfast, 18 holes and a 2 course dinner. If you’d like to come along, please get in touch – admin@leewaynwa.org.uk or 0300 561 0077.